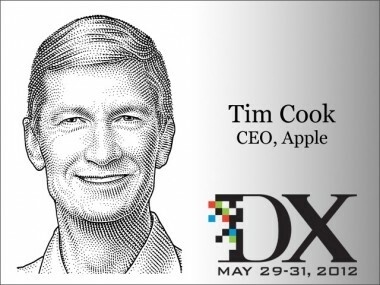 Tim Cook was interviewed about a range of topics at DX, including Steve Jobs. Here is a summary on the remarks on Steve Jobs leadership style. 6:33 pm: Walt: How is Apple different with you as the CEO? “At some point late last year, I sort of — somebody kind of shook me and said, ‘It’s time to get on.’” That sadness was replaced by his intense determination to continue the journey. 6:34 pm: What did I learn from him? Focus. Cook also made a reference to the fact that Jobs stressed the importance of owning the key underlying technologies. 6:37 pm: Cook says he is committed to preserving the culture of Apple. “It is not that easy to duplicate, either,” Cook says. “If they could, everybody would be like this,” Cook says. “You can’t get a consultant report” and change to be like Apple. 6:38 pm: Cook says that Jobs told him not to ask what Steve would have done. Cook notes that Jobs was well known for doing a 180-degree turn if needed, without ever letting on that he had advocated the opposite. 7:27 pm: Kara: What do you do all day? What do you see your role at Apple as on a daily basis, and are you a visionary? 7:30 pm: Who’s the curator at Apple these days? Walt asks. Cook: “We have a privilege, because if I look around the executive team, many of the people are people I have been working with for double-digit years.” We all get along well, Cook says. No one person can do it all, Cook says. Cook says, “I wouldn’t get overly focused on who does what piece.” There’s a lot of key people, and there have always been a lot of key people. Kara: What’s your goal? Make a trillion dollars, create your version of the CIA? Companies can get lost, he says, focusing on revenue, profit or stock price. “You have to focus on the things that lead to those,” he says. 7:33 pm: What do you look up to? Is there a person or a company? 7:41 pm: What did Steve say to you to encourage you to join Apple when you did, and did you see Apple becoming what it has become? Also, he says, he was impressed that Jobs wasn’t focused on money. “I thought, I am going to throw caution to the wind and do this,” Cook says, adding he resigned immediately from his former job. He can’t say that he saw iPhone and iPad coming, but he saw the passion in Apple customers, as well. They might get mad, but they stayed loyal. 7:49 pm: What has been the biggest challenge in the post-Steve Jobs era? That, he says, was a bit of a surprise. He had been getting hundreds. Today, he says, it is a privilege. Especially since he doubts it is like that somewhere else. “I can’t say anything (else) has surprised me,” he says.